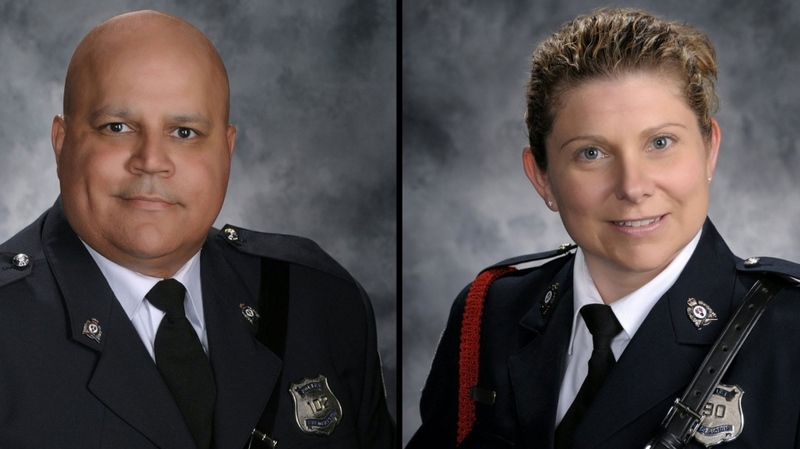 Two police officers have been identified among four victims killed Friday in an early-morning shooting at a Fredericton apartment building. Lawrence Robert Costello, 45, served with the Fredericton Police Force for 20 years. He leaves behind a common-law partner and four children. Costello’s common-law partner, Jackie McLean, told the Canadian Press she learned the devastating news from a police inspector. 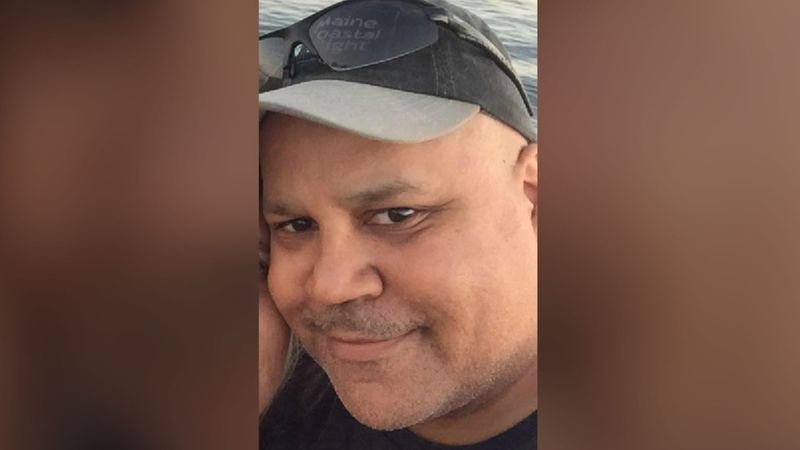 "He used to always say to me that it did not matter what happened, that he would always come home, and this is the first day that he has not home," McLean said. The second officer, 43-year-old Sara Mae Helen Burns, was on the force for two years, police confirmed. She is survived by three children and her husband. The two other victims have been identified by police as an adult man and woman. 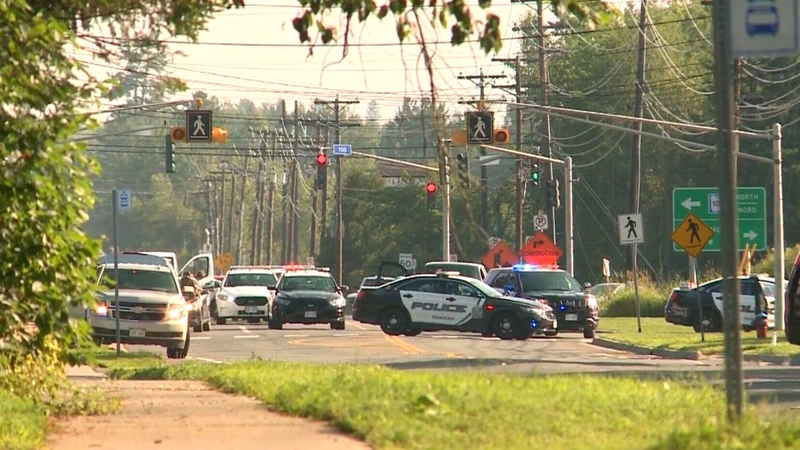 A 48-year-old man from Fredericton was arrested at an apartment complex in connection with the shooting, which broke out in the area of Brookside Drive between Main Street and Ring Road around 7:10 a.m. The suspect is being treated for “serious injuries,” police confirmed. The officers responded to a “shots fired” call in the north-end residential neighbourhood. Costello and Burns were the first officers on the scene. When they arrived, police said, the two civilian victims were already on the ground. At that point, police said, the two police officers were shot. More officers arrived and initiated a full lockdown of the area, police said. Officers then engaged with the suspect and shots were fired by police, police said. The suspect was arrested at the scene. Police would not reveal what type of firearm was used. Just after 11 a.m., police confirmed there was no further threat and that the lockdown was no longer required. 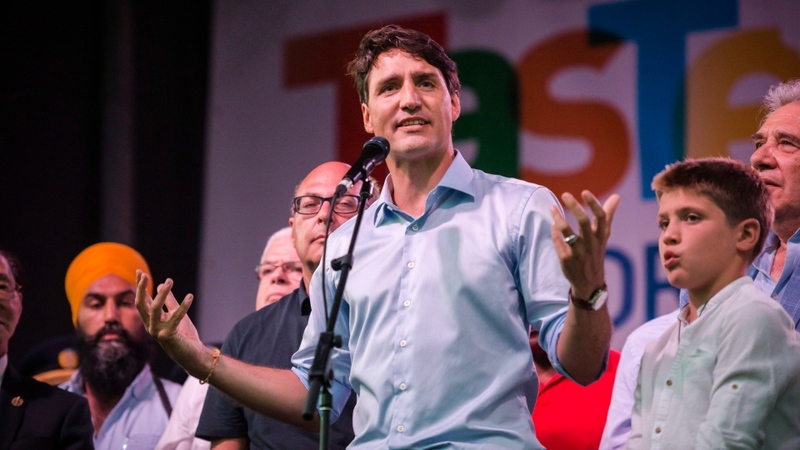 Prime Minister Justin Trudeau addressed the tragedy at the Taste of the Danforth Festival in Toronto on Friday night. The event was held in the same neighbourhood where, just over two weeks ago, a shooter killed 18-year-old Reese Fallon and 10-year-old Julianna Kozis. 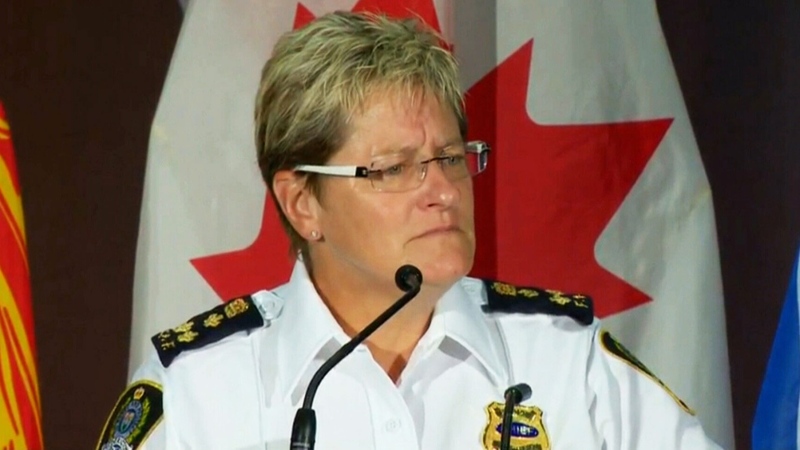 Earlier in the day, Fredericton Police Chief Leanne Fitch told a news conference that confirming the names of her two colleagues was “the worst moment for any chief of police.” She also expressed gratitude for her force’s swift response. “I couldn’t be prouder of the men and women that serve this city,” she said, adding her thoughts and prayers are with the victims’ families. 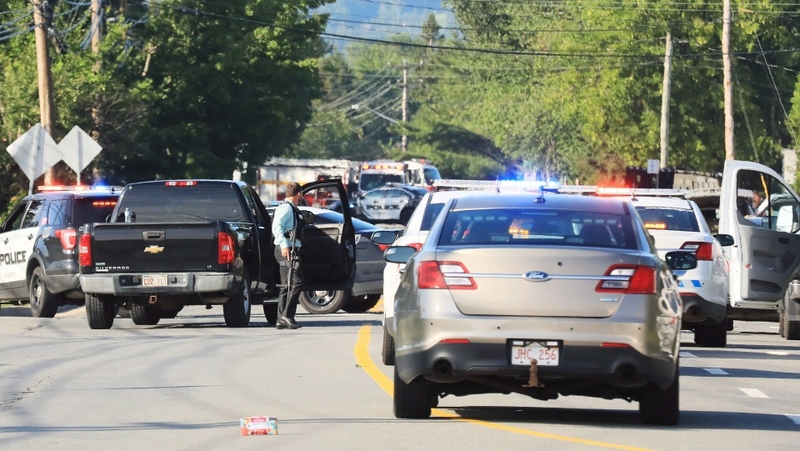 RCMP will be taking over the homicide investigation, Fitch said, and external officers have been called in to help provide shift relief for Fredericton police. Nova Scotia’s Serious Incident Response Team, an independent body that probes serious incidents involving police in Atlantic Canada, is also investigating. New Brunswick Premier Brian Gallant also personally thanked first responders. “We thank all the courageous women and men who form our first responders. They are a special kind of person. 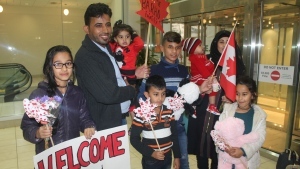 They put themselves in harm’s way to keep all Canadians safe,” he said. Fredericton Mayor Mike O’Brien said he received a call from Prime Minister Trudeau shortly after the shooting. O’Brien called for the community to exercise patience as officials investigate what happened. “In this community, we grieve together, but we’ll heal together as well,” O’Brien said. Costello’s partner said they lived together for five years, and he had two adult daughters from a previous relationship. She described Costello as someone who loved his job and was “the only police officer who I have ever known who could write someone a ticket and have the person thank them after." "One thing that Robb was very adamant about was that if something ever to happen to him he did not have a sad funeral, he wanted to have a party with lots of laughs and happy memories," McLean told the Canadian Press. "I am hoping that we will be able to put something like that together." Reporting from the scene, CTV Atlantic’s Nick Moore said that police were escorting residents from their homes following the announcement that one suspect was in custody. Between 7 a.m. and 8 a.m., Moore said there was a large police presence on Brookside Drive where officers appeared to be focused on a single residence. “There is a police officer standing outside with a gun,” he told CTV’s Your Morning. Moore said he heard approximately four gunshots within a five-minute timespan during that hour. 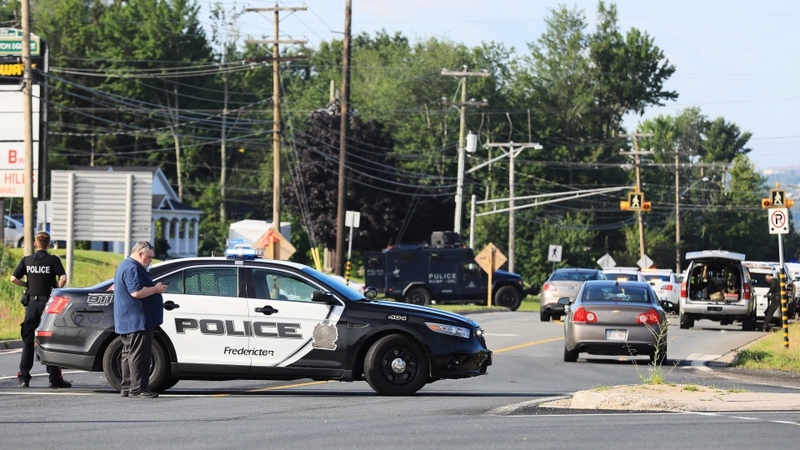 In a series of tweets about the incident, Fredericton police asked residents to avoid the area and stay inside their homes with the doors locked. People standing outside the cordoned off area early Friday told Moore that they were instructed to vacate their homes while they were still in their pyjamas. David MacCoubrey told the Canadian Press that it was shortly after 7 a.m. when he awoke to the sound of gunshots that sounded like they were "10 metres" from his bed in his apartment on Brookside Drive. He said he first heard three gunshots that woke him up and then heard as many as 17 more between that time and 8:30 a.m.
Tim Morehouse, who also lives in the apartment complex, said he heard someone yelling, “Shut up! Shut up!” from outside. When he looked out of his window, Morehouse said he saw the body of a man lying on the ground in the parking lot. After calling 911, Morehouse said he looked out the window again and saw two police officers lying on the ground. Rachel LeBlanc was on her way to work when she saw police cars speed by. She told CTV News Channel she heard four gunshots at approximately 7:30 a.m., as she arrived at the centre. LeBlanc said the daycare centre she works at is located “extremely close” to where the shooting occurred. She didn’t want to say how many children were currently inside the building with her, but she said a few children had already arrived before news broke of what happened. LeBlanc said she called the police’s non-emergency line and was told by the dispatcher to go on lockdown. LeBlanc, who lives in the area, said she’s still processing the morning’s events. 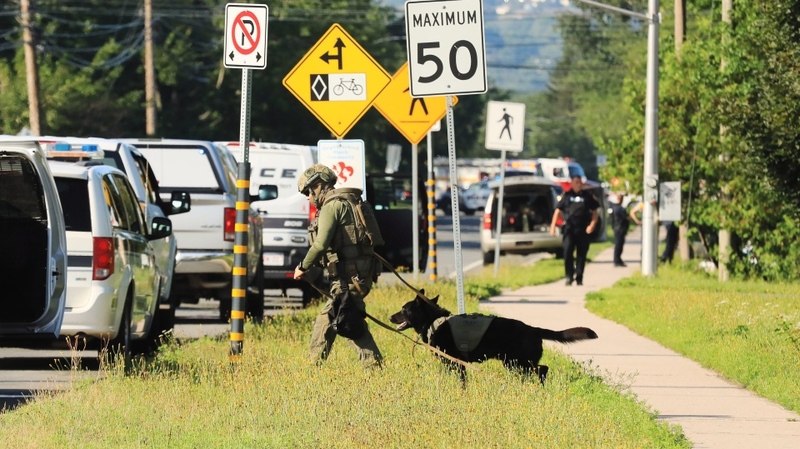 The shooting is reminiscent of the deadly shooting rampage in Moncton, N.B. by a lone gunman that left three RCMP officers dead in 2014, LeBlanc said. We are asking people to avoid the area of Brookside Drive this morning due to an ongoing incident. We will provide more details as soon as we can. Heavy police presence in a Fredericton neighbourhood, Friday, Aug. 10, 2018.